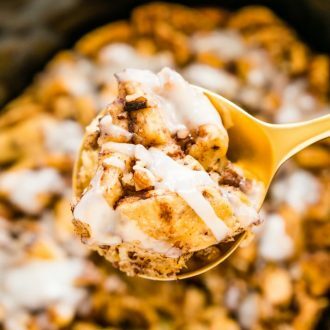 This Slow Cooker Cinnamon Roll Casserole is the perfect lazy breakfast for weekends and holidays! An easy and delicious sweet breakfast treat that’s loaded with cinnamon, maple, pecans, and more! 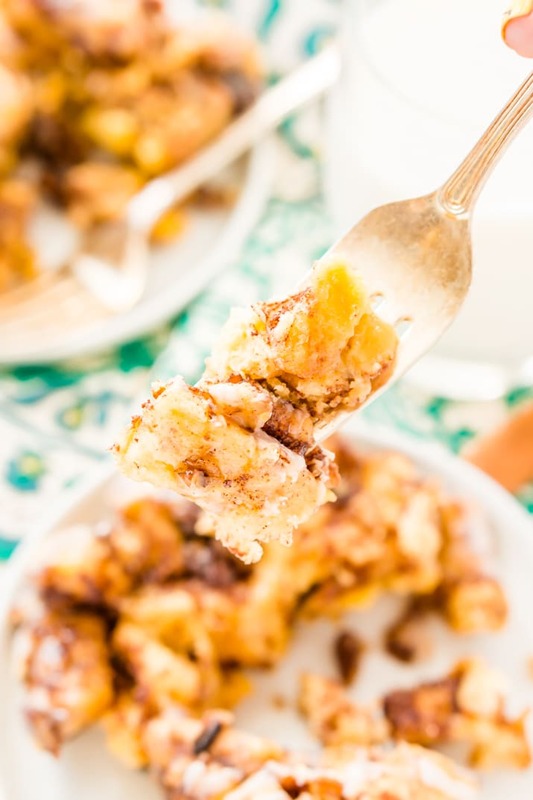 In my opinion, there’s nothing better than a lazy weekend morning, and Slow Cooker Cinnamon Roll Casserole is the perfect recipe to enjoy when you’re lounging. I LOVE slow cooker recipes for one reason: they’re easy! All that hands-off cook time means free time to get things done… or more importantly, catch up on your favorite TV shows. 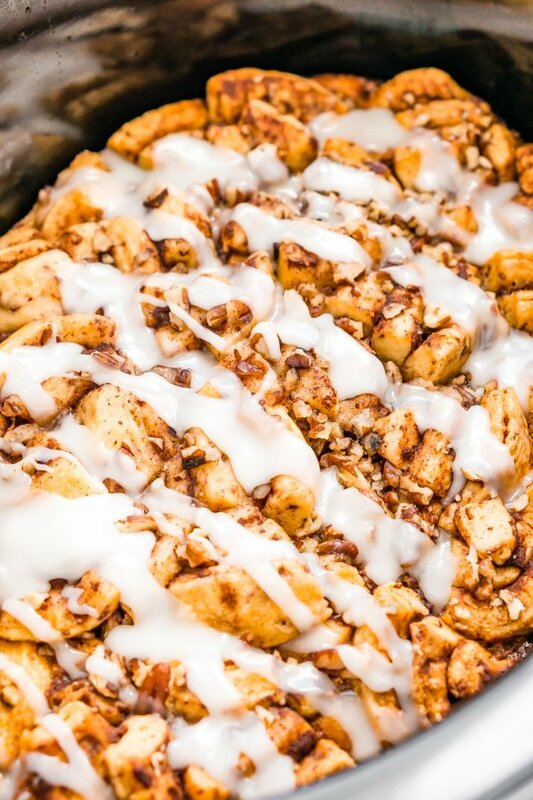 This Cinnamon Roll Casserole is so yummy and is made with packaged cinnamon rolls, an easy “hack” for quick prep. Heavy cream adds richness to this dish, and a dose of maple syrup adds another hint of classic breakfast flavor. This recipe is like a cinnamon roll/French toast hybrid that’s golden brown on the outside, soft and eggy on the inside. It’s topped with a generous layer of icing (of course!) and a handful of pecans for a little extra crunch. 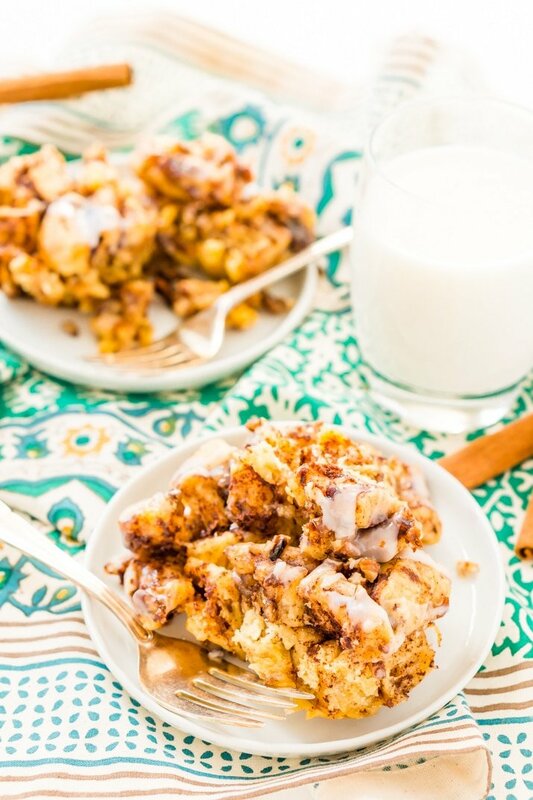 If you have kiddos at home, you can bet they’ll go head over heels for Cinnamon Roll Casserole on a Saturday morning. Make it once, and they’ll be begging for it every weekend — it’s that addictive! And a note to grown-ups: this ooey gooey pot of goodness tastes divine alongside a mimosa! Don’t worry, the youngsters will enjoy it almost as much with fruit juice or chocolate milk. Aside from the occasional slow-paced Sunday (which is far and few between, nowadays! ), I’ll make this Cinnamon Roll Casserole recipe on holiday mornings. This yummy breakfast is also perfect to serve when you host brunch time get-togethers; just throw everything into the slow cooker, then go mingle with guests until it’s ready! If you plan on having the family over for Easter, you may want to tuck this recipe into your back pocket. My Favorite Slow Cooker!Buy Now! Serve this sweet treat alongside some fresh fruit or berries, and yes, you can even top it with a dollop of whipped cream. Maybe fry up a few batches of bacon, and your breakfast plans are set! 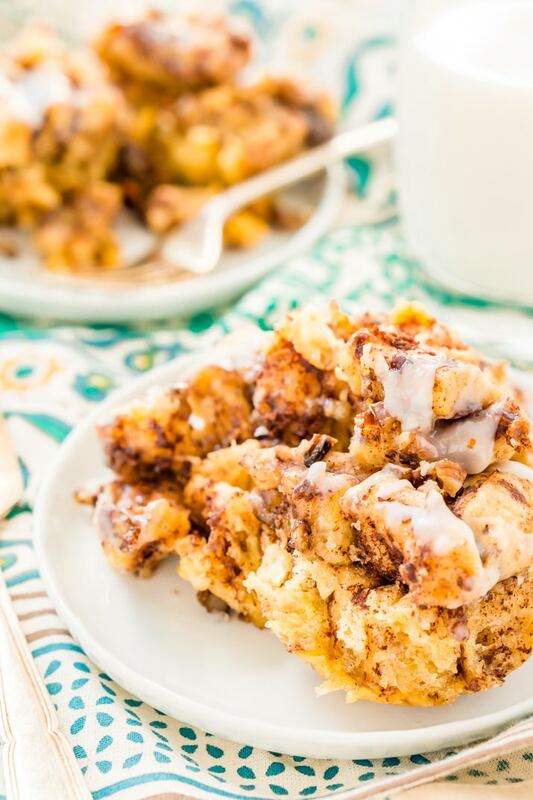 Cinnamon Roll Casserole combines classic breakfast flavors in one delicious, easy-to-prepare dish. This may become your new go-to recipe for holidays and slow weekend mornings when you’re lounging around at home! Pin this Breakfast Casserole Recipe for Later! 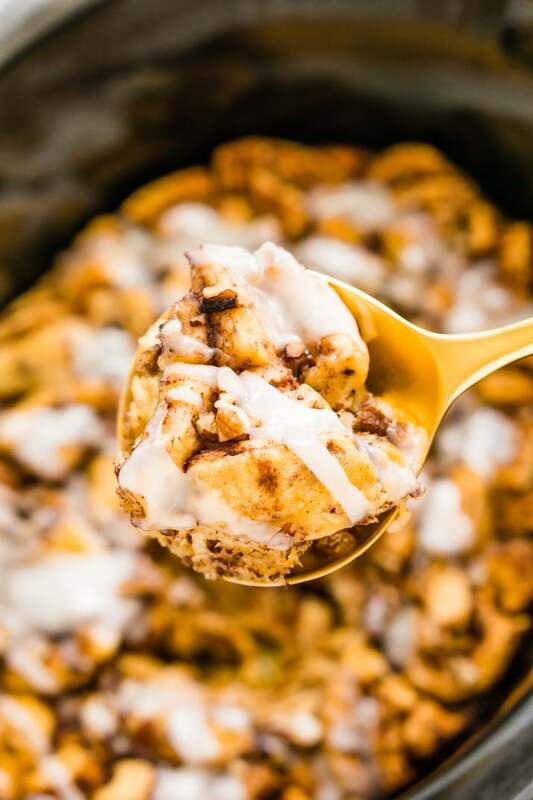 This Slow Cooker Cinnamon Roll Casserole is the perfect lazy breakfast for weekends and holidays! An easy and delicious sweet breakfast treat that's loaded with cinnamon, maple, pecans, and more! Spray an 8-quart slow cooker with non-stick spray. Arrange the pieces of cinnamon rolls evenly in the slow cooker. Whisk together the eggs, heavy cream, maple syrup, cinnamon, nutmeg, and 1/4 cup of pecans. Pour the mixture over the cinnamon rolls. Drizzle one of the packages of icing over the cinnamon rolls and cook on low for 2 to 2 1/2 hours. Once the rolls are golden brown, drizzle the remaining icing over them and sprinkles with the remaining nuts. Serve warm.